There is good news for those 2-wheeler users who ride with the risk of carrying the whole family which includes a couple and its 1 or 2 small children, on the zooming bike. 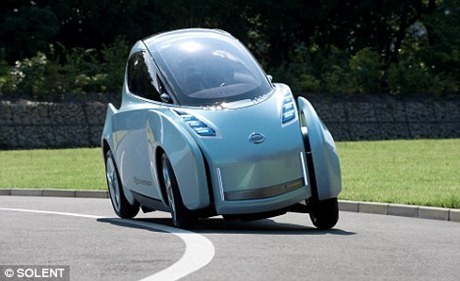 According to a media report, automobile engineers at car maker Nissan have designed a two-in-one sort of a vehicle, known as Land Glider, which has four wheels and a capacity for two-seats, looks like a half-car, half-scooter. 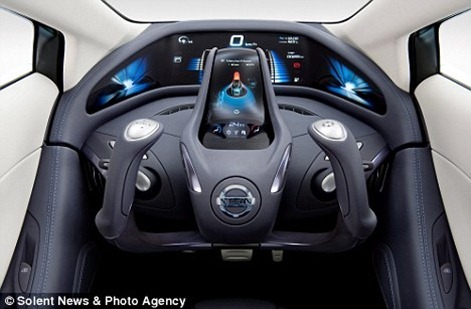 The vehicle is little more than half the width of a usual family car and works on electric (lithium battery) power. This electric-powered vehicle has a glider-like cabin, leans into corners and has a top speed of 62 mph or 99.7 kph. The computer in the Land Glider takes into account speed and steering angle before automatically calculating the amount of lean required to corner. Basically, the vehicle could be a breakthrough of sorts which thrives on ecologically sound electric power and could prove out to be a boon for urban areas already thwarted by traffic jams and needs optimum urban mobility going into the future. This vehicle could also prove a boon in urban areas which face an acute crunch of open parking spaces and related traffic snarls. The new vehicle could be conceived as new form of zero-emission mobility with a personal feeling of a ride with your dearest colleague. However, there are some negatives for this new design car. Most of such hybrid cars that work on alternative fuel elements do not come cheap on pocket to make it affordable to the low to middle class public. In India, we have a much affordable Tata’s Nano which offers a cheaper alternative to the 2-wheeler family riders to be accommodated in a low-cost car for a safety ride. However, even the Nano, which is almost a usual sized car, would still face the hassles related to parking space. Whereas, Land Glider, whose width is little over half width of a usual car, could be a better model to fit in a small occupying space just like a 2-wheeler. But, the seating capacity in this car would be only 2 persons as against 4 multi-riders in the cheaper alternative of Nano. If the rider is not to be a driving-enthusiast, the seating capacity would be further reduced as a driver plus one another rider. I feel, the vehicle, if and when introduced in India, could meet little commercial success as the passionate riders would either opt for a 2-wheeler zooming ride or opt for a small yet affordable car in Nano with multi-seating capacity more than two-seaters. Newcastle Upoan Tyne driving school supplies 1st 5 driving lessons just £49.99 automatic driving lessons 1st 5 £14.99 each by DSA approved driving instructors. I would like to request the author to pardon me for the offtopic comment. I have reservation about an electrical bike / car being called ecological / environmentally friendly / green vehicle. Any vehicle needs power, be it petrol / diesel / electric. In diesel / petrol the engine burns the fuel and everybody can see the flue gasses so they are called non green. Where as an electrical vehicle runs on electricity. The plug in is a convenient system. We can not see any flue gasses. But ultimately the electricity comes from a power source which burns fuel (coal / gas / naphta / diesel in a power plant). We are only displacing the pollution to a remote power plant instead of on city roads. In diesel or petrol vehicles, the fuel is burnt in engines which are small. In power plants the generators are huge often as big as 1000 MW. As a thumb rule the fuel to energy conversion efficiency for bigger plants is more. Therefore electrical vehicles cause lesser pollution. But calling any electrical vehicle a green vehicle is unacceptable. However with the available technology, the authorities should encourage electrical vehicles (without calling them green) as it serves two purposes. 2) More efficient use of fuels for generating same energy to drive vehicles.